Belfast International Airport is to be sold to the US-based firm, ADC & HAS Airports Worldwide, which has interests in airports in Costa Rica and Ecuador. Belfast International has been owned by the Spanish company Abertis since 2005. Abertis is also selling Stockholm Skavsta airport and other assets to ADC & HAS for a total of £244m. The deal with Abertis is pending approval of minority shareholders and US regulators. Belfast International is the second largest airport in Ireland and handles around 4.3m passengers a year, well down from its peak of around 5.5 million in 2007. Belfast International Airport is to be sold to the US-based firm, ADC & HAS Airports Worldwide. The airport has been owned by the Spanish company Abertis since 2005. Abertis is also selling Stockholm Skavsta airport and other assets to ADC & HAS for a total of 284m euros (£244m). The deal with Abertis is pending approval of minority shareholders and US regulators. ADC & HAS has interests in airports in Costa Rica and Ecuador. “We are extremely pleased with this acquisition,” said Jeff Scheferman, chief executive of ADC & HAS. “With it, we add to our portfolio two airports serving capital cities. 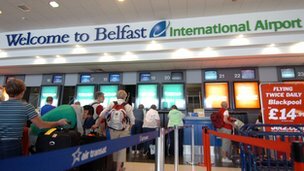 Belfast International is the second largest airport on the island of Ireland and handles around 4.3m passengers a year. The airport can trace its aviation history back to the First World War, when Aldergrove in County Antrim was selected as a military training base for the Royal Flying Corps. Northern Ireland’s first regular civil aviation service began at Aldergrove in 1933. Fifty years later, the facility was officially branded as Belfast International Airport. It was privatised in July 1994. Posted: Tuesday, July 23rd, 2013. Filed in News about Airports, Recent News.